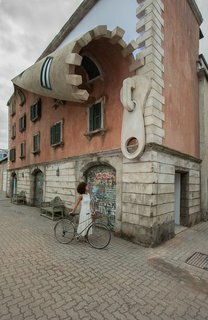 Famed for his mind-bending twists of architectural art, Alex Chinneck has previously melted buildings, fabricated and ripped apart an entrance to Covent Garden's market, peeled off the front of one house, and flipped another on its head. Now he's applied a technique he first used on an abandoned office block in Kent, England, to an old Milanese building, creating the illusion that its facade is being unzipped. 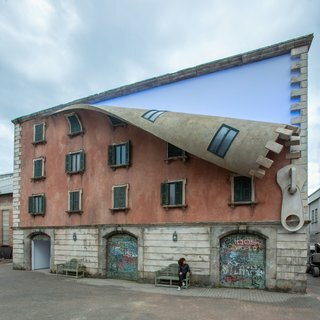 The giant zipper on the side of this Milanese building is part of Chinneck's latest installation. "These pieces are not conceptually driven, or trying to deliver a particular message," he told The Guardian newspaper in 2012. "The aim is to astound people and just cheer them up a bit." His works may not always be cerebral, but they are brain-teasers and remarkable feats of engineering. The temporary installation will be open for the duration of Milan Design Week. Chinneck works with largely abandoned architecture as his canvas. His pieces require all the planning, materials, and engineering prowess of any construction project, and he collaborates with an illustrator and an architectural engineer on all of them. "I create the problems and he solves them," Chinneck told The Guardian. A project in London's Canary Wharf titled A Bullet From A Shooting Star required 110 tons of concrete and 1,300 feet of steel, and took a year to complete. The unzipped building glows from within at night. Zippers inside the building provide a peek into an illusory future. 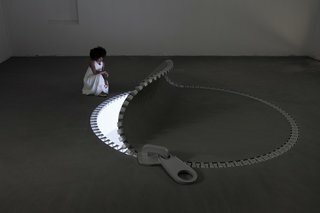 The Milanese installation takes his zipper fetish a step further, bringing the concept inside the building as well. A floor "unzips" to reveal a bright white light, and an internal wall is similarly disrobed to reveal another glowing light. "Ethereal light pours through each opening, filling the space with color and filling the work with a sense of positivity and potential," says Chinneck. "By taking familiar materials and architectural forms and making them behave in extraordinary ways, we are working with IQOS to change visitors’ perceptions of what is possible," says Chinneck of his collaboration with the Philip Morris International Brand, which sponsored the installation. "Through the repeated use of the zipper, we have opened up the fabric of a seemingly historic Milanese building to playfully re-imagine what lies behind its facade, floors, and walls." 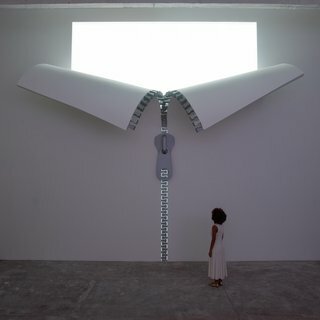 Chinneck's work combines art, architecture, and theater on a massive and often playful scale. 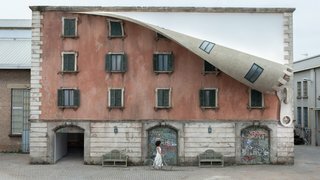 To create the zipper trick, Chinneck excavated and re-poured an entire concrete floor, and he built a new exterior for the historic Via Tortona structure. He hasn't revealed how the zipper itself is constructed, but his previous project involved a composite of rubber and other flexible materials. The sheer scale and creativity of Chinneck's work makes it remarkable, as are his attempts to disrupt laws of physics and make the impossible appear possible. Seeing one of these structures in real life makes you almost feel as if you are standing in a cartoon, stepping outside of reality into something comforting and familiar—but entirely bizarre. 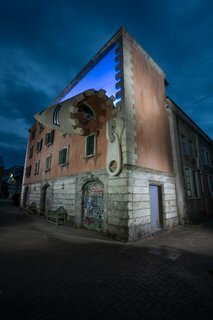 Is it a building or is it art? Chinneck's installations are mostly temporary, often taking advantage of derelict structures. The temporary installation, Chinneck's first outside of Britain, is on show at Spazio Quattrocento, Via Tortona 31, Milan 20144 for the duration of Milan Design Week, which concludes April 14.